"I would not have missed the trip for anything," said Mr. Pearce Lello, of Trevassack Farm, Hayle, looking fresh and well after crossing to New York and back on the "Queen Mary" on her recent maiden voyage. "Concerning the vibration of the ship it was noticeable in certain quarters of the tourists' accommodation, and was even more noticeable to those who, like myself, had never been to sea before. The general lay-out of the ship was marvellous, and in a shop in the tourists' section it was possible to get anything from a stud to a suit of clothes. "The reception we received when we reached New York is simply indescribable; it was far more impressive than the send-off at Southampton. There were about 500 police on duty outside the docks to keep the large crowd back. The American Press were absolutely high in their praises of the ship, and when we docked it was possible to buy papers with a full description of the 'Queen Mary's' arrival. Never before in the history of shipping had there been such a reception. The only disappointment that the Americans felt was that the 'Queen Mary' had not captured the Blue Riband of the Atlantic. "The American people were very hospitable and left nothing to be desired. The hotel accommodations were very fine." Giving a description of the voyage and the immense size of the ship, Mr. Lello and [sic] that the outward voyage was more enjoyable than the homeward voyage; the passengers did not appear to be so sociable on the return. He found that the most friendly were the Irish. Mr. Lello made friends with some of the other passengers, and said that one evening they decided to go up to the bows of the ship. The journey took three-quarters of an hour from the tourist quarters. "One could easily get lost on the boat. The way the stewards worked was fine, and they were only too willing to help everybody. There was no vibration in the third and cabin classes, and in certain sections the tourist class. Everything was comfortable. The smoking room was beautifully laid out and the last word in comfort. "She is a ship to be seen to be understood and a trip in her would be even better. No doubt in time, they will eliminate the vibration altogether and make other improvements. Most of the lights on the 'Queen Mary' are concealed and there must have been a large staff of electricians in charge. There was a crew of 1,200 and the cabins were very comfortable. The main announcements were made at meals, through the medium of loud-speakers concealed in the pillars of the dining hall, and one had to look very closely to see where the speakers are situated. "The concert on the outward voyage," continued Mr. Lello, "was held in the main lounge of the cabin class and was of a very high standard. The lounge will hold between 300 and 400 people and on this occasion was packed to capacity. Henry Hall conducted the ship's orchestra at the concert and Larry Adler, the famous harmonica player, also took part, as did Frances Day, the film actress, and Tekar, whose singing reminded one of Richard Tauber. The collection, which was in aid of seamen's charities realised £175. "On the return voyage Carl Brisson, the actor was on board, and made himself very popular with the rest of the passengers. Joan Bennett, the film actress, was also with us when we returned and many other celebrities whose names I have forgotten. "The devices for the safety of the passengers are marvellous. If a room got overheated or caught fire a spray of liquid would be automatically released from the roof of that room and extinguished in a few minutes. 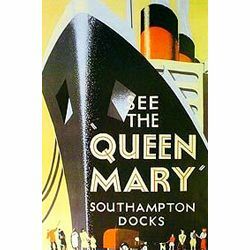 I should think the 'Queen Mary' was practically unsinkable, all the safety doors being shut by hydraulic pressure and controlled from the captain's bridge. "The space allotted to tourists for fames [sic] is very generous." On the return voyage one of the A.B. 's died and was buried at sea, and Mr. Lello said it was surprising the few who knew anything at all about it. Nobody was allowed at the funeral service and Mr. Lello was one of the few who saw the burial. During the service the Union Jack was flown at half-mast. Mr. Lello said that high Mass was held every morning in the main lounge. The Church of England services were impressive and were held in the main lounge of the tourist quarters. They were largely attended. "The finest sight I saw in America," Mr. Lello continued, "was Radio City, which seats approximately 6,000 people."